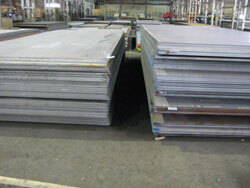 One phone call gives you quick, reliable access to a wide variety of grades and sizes of steel plate. We maintain a full-range of inventory so we can respond to your needs without hesitation. 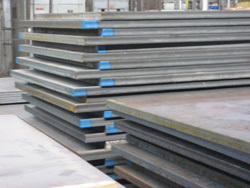 Our vast inventory includes carbon, high strength and alloy, whether you need the popular A-36, A-572-50, and A-588, or a hard to find grade such as A-709/AASHTO, A-36 Floor Plate, A-514 or the formable grades of AR400. We also carry many intermediate thicknesses which are hard to find. The list below represents our large inventory of Domestic Prime Plate, all with notarized mill test reports. **A 36 3/16" thru 12" 72", 84, 96", 120" 120", 240", 288", 480"
**A 572 GR 50 3/16" thru 4" 96" 120", 240", 480"
**A 572 GR 42 4 1/4" thru 6" 96" 120", 240", 480"
** A588 3/16" thru 6" 96" 240", 480"
Floor Plate: A 36 and CQ 3/16" thru 1" 96" 240"
A 514 GR B, H, F, Q, S, E 3/16" thru 6" 96" 240", 360", 480"
AR 200 3/16" thru 1/2" 96" 240"
AR 400 FORMABLE 1/4" thru 3" 96" 288"
**Available in ASTM A 709 and AASHTO M 270 Grades with Charpy Impact Test Values for Zone 2. Other grades and sizes available by inquiry. Millimeter sizes are available in some grades.